Fungia, or plate corals, are free-living corals that consist of one large polyp and usually a single mouth. 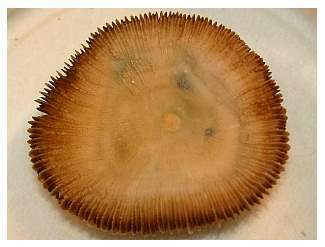 There are 18 recognized species of Fungia, all from the Indo-Pacific,1 and another 10 species of Cycloseris, a very similar, though usually physically smaller, genera of plate corals. A few species of plate corals are easy to tell apart, but many would be difficult for the casual aquarist (like me) to distinguish. A careful examination of the bleached out skeleton might be necessary for proper identification, something I usually try to avoid with the specimens in my tanks! So, for the purposes of this article, I'm going to assume that the specimens I work with are all Fungia, though admittedly I do not know for certain that they are. In any case, the techniques I discuss probably apply equally well to the many similar genera of plate corals. Three forms of Fungia that the author has successfully propagated using the methods described in this article. My first experience with Fungia was accidental. Early in my days as a hobbyist I'd purchased a colorful soft coral attached to a small rock. In a few weeks the soft coral had withered away but, being lazy, I left the rock in the tank. After a few weeks I noticed a very small polyp starting to grow, attached to the rock. I had no idea what it was, because it was about the size of a sesame seed. It continued to grow for the next six months or so to about the size of a half dollar. At that point the now recognizable Fungia broke free from its attachment point on the rock and became free living. It continued to grow, and retained its standard brown color for many years. The fascinating thing for me was that I noticed that a tiny amount of living coral tissue remained at the point where the free-living polyp had broken free. Over the course of the next few weeks, this living tissue grew over the bare skeleton that was left where the coral had detached. The tissue re-formed into another polyp and began to grow again, soon looking identical to the way it had before the first polyp's detachment. This went on for several years, and I ended up with three or so babies being "born" from this single attachment point. Eventually I had some serious problems with a tenacious form of algae known as Bryopsis, which is unpalatable to most herbivores. The attachment point was overgrown with algae, and that was the end of my Fungia "factory." Having several identical Fungia in hand, however, I felt it was time to experiment with some fragmentation techniques on this coral. To this day, I still have several of this coral's daughter clones, which I obtained from my propagation efforts. On the reef, plate corals usually do not have the "puffed-up" appearance that they commonly have in reef aquaria. I've also noticed while diving that plate corals seem to be found quite often with their mouth side down, with no particular harm coming to them in this orientation, other than being a bit pale if you flip them over. Perhaps the toast falls butter side down quite often on the reef, too! On the reef, Fungia are often found on small rock ledges, not necessarily on sand surfaces; and only at night do plate corals completely extend their tentacles and swell up with water as they actively try to capture plankton. Within a few minutes captured particles of food can be shunted along the coral's surface to its mouth. Their mouth can open wide to allow the coral to consume surprisingly large prey organisms. In an aquarium they are best fed at night by slowing water motion temporarily and dropping the food (grated seafood, Mysis shrimp, brine shrimp, etc.) directly onto the coral. In some tanks it is necessary to guard the coral from aggressive shrimp, hermit crabs or hungry fish until the coral can completely engulf the food. While feeding plate corals may accelerate their growth rate, I have found that in the average, well-lit reef aquarium, most can gather a sufficient amount of energy from their internal zooxanthellae (photosynthetic symbiotic algae) and the nutrients normally present in the tank to grow at a reasonable pace. As with all corals, unless you are trying to save an ailing coral by cutting out a diseased portion of it, it's best to consider fragmenting only very healthy specimens. For propagating Fungia, the most important tool is a diamond cutoff wheel for a high speed rotary tool. 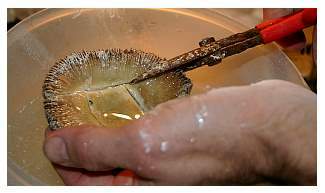 This will allow you to cut cleanly though the coral's skeleton and minimize tissue damage. 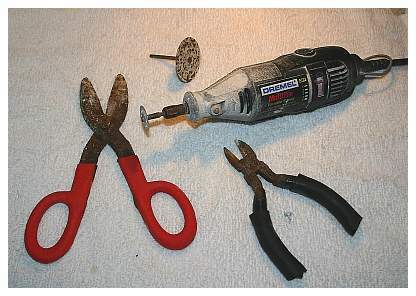 A standard diamond cutoff wheel is made by Dremel,2 but much larger diamond cutoff wheels can be found and can be useful for some purposes.3 It's also handy to have a pair of cutting pliers or fragging shears. Tools useful for fragmenting plate corals (ignore the rust!). After the pieces have been separated they should be put back into an area of the aquarium with good circulation, with conditions similar to those to which the original colony was exposed. There may be some advantage in placing the cut pieces on coarse rocks rather than sand, which will maximize the water flow around any damaged tissue and reduce the chance of a microbial infection taking hold. Under good conditions the coral tissue usually grows quickly over any bare skeleton surfaces exposed during the propagation. It may be particularly important during this time period to have good control over filamentous algae in the tank, as Fungia are not particularly good at competing with any algae that takes hold on their skeleton. Fungia colony ready to be cut up. Marks from previously performed propagation efforts are evident on the underside of this Fungia. 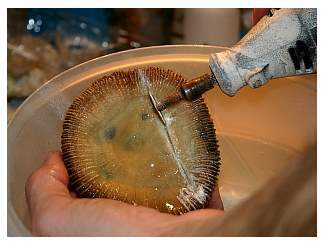 A high-speed rotary tool with a diamond cutoff wheel is used to make straight line cuts on the underside of the coral. 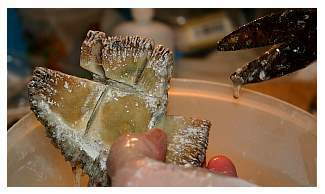 Once the coral is scored, the pieces can be fully separated using cutting pliers or tin snips. If a larger diameter diamond cutoff tool is available, it may be possible to cut completely through the coral, but more damage to the living tissue is likely to occur as the heat from the cutting "cooks" the tissue on the coral's upper side. Photos by the author's daughter. Unfortunately, most Fungia are fairly slow growing corals. It might be possible to fragment a Fungia only once every few years. Over time the corals regain their roughly circular form, though sometimes they may have unusual skeletal features, and sometimes multiple mouths. Unusual skeletal patterns of propagated Fungia. 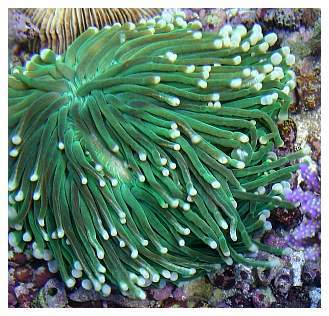 The far right photo shows the coral's underside with the original colony's clearly visible pattern. In some cases propagation may be accidental. I've heard of extreme cases of aquarists having poor conditions in their aquarium and the living coral tissue on a Fungia separating into small areas on the skeleton. When conditions improve, each of the separate sections re-forms into its own separate coral (anthocauli), initially attached to the original parent skeleton. Once healthy, there is no reason these could not be cut apart and allowed to grow into individual colonies. 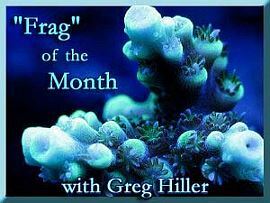 I've even heard of damage from having an aquarium heater sitting on top of a Fungia resulting in the same type of "propagation." These are not methods I recommend, though! Another propagation technique that has been reported to me involves placing a Fungia in a very low light condition for several weeks and then suddenly exposing it to very strong metal halide light for a few days.5 The severe shock can cause a condition similar to that mentioned in the previous paragraph - a multitude of small anthocauli that can be separated and grown out. 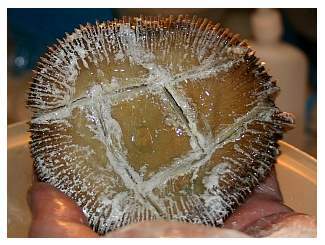 The techniques I have mentioned in this article can likely be used for most plate and tongue corals. This includes the genera Diaseris, Cantharellus, Ctenactis, Herpolitha, Polyphyllia, Sandalolitha and Halomitra. It might also work on "Chalice" corals. 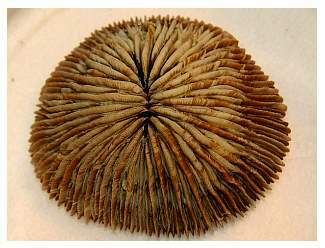 I have been warned away by others, but I have also seriously considered trying my hand at fragmenting my Heliofungia actiniformis (long-tentacled plate coral). If I'm successful, perhaps that will be another article. Top-down photo of the author's Heliofungia actiniformis (long-tentacled plate coral). 1. Veron, J.E.N. 2000. Corals of the World. Australian Institute of Marine Science, Townsville. 3 Volumes. 4. Personal communication, Rob Toonen 2006, experiments performed by Leah Hollingsworth under the direction of Dave Krupp at Windward Community College, Kaneohe Hawaii. 5. Personal communication, Joe Scavo, 2006.